A few months ago, I left my home in Adelaide and travelled up to Maules Creek, New South Wales. I’ve never been much of a wanderer, but when I heard that Whitehaven was working on the largest coal mine currently under construction in Australia in the middle of the Leard State Forest, I realised that things were pretty serious. At first, I couldn’t understand how such a massive new coal project had been approved. We’ve suffered numerous “once-in-a-lifetime” natural disasters in rapid succession these past few years, and every credible climate scientist agrees that this is only the beginning. 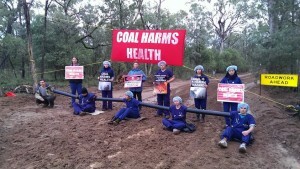 What sane politician would approve another massive coal mine? But when I looked into it, I started to read about alleged illegal political donations from Whitehaven’s subsidiaries. I learned that the chairman of Whitehaven’s board of directors is none other than Former Deputy Prime Minister Mark Vaile and that the deputy chairman is also the President of the Commonwealth Remuneration Tribunal, the body responsible for determining the awards and benefits of court officials, public servants, federal parliamentarians, etc. Now it’s been reported that the NSW Independent Commission Against Corruption (ICAC) is finding that the relationship between politicians and developers is highly questionable and provides potential for corruption or undue influence on decisions. I fear that the manner in which Whitehaven gained its approvals might soon become apparent. When I arrived I was concerned with climate change first and foremost. I was also worried about what this project meant for our food security. If farmland is sacrificed for short-term mining profits as a matter of policy, what does that mean for us in the long term? But I found another problem here, one that I’d vastly underestimated. For as long as I can remember, I’ve loved the myths and legends of Greece and Rome, the old Nordic stories, amongst others. That culture and heritage is important to me. So when I found out that this mine was being built on Gomeroi country, I was concerned. I don’t know much about the Gomeroi people and their heritage, but I know that culture doesn’t have to belong to white people to be important. I know that this culture is just as sacred to its people as my culture is to me. When I spoke to the Gomeroi, they told me that their ancestral burial sites, women’s sites and men’s sites were being destroyed. Their cultural artifacts that had been preserved for thousands of years are being destroyed, and they have been denied the rights to undertake a smoking ceremony to pay respect to their ancestors and heal the land. The destruction of the sacred sites of this ancient, living culture is inexcusable. That our government appears to consider it permissible is one of the most telling examples of racism in our society. If someone destroyed our heritage this way – The Opera House, for example, or going further back, the Parthenon, the Sistine Chapel, Stonehenge – there’d be hangings. With the apparent lack of government intervention, it seems that Whitehaven think they can get away with it because this destruction is being inflicted on someone else’s culture. The Gomeroi struggle continues and they are seeking government intervention to ensure they can undertake ceremony. No mining company should be allowed to deny this basic right. But what does it mean to come out to a blockade camp and try to put a stop to this? After the forced closure of the forest ejected our camp, a local farmer was kind enough to let us camp on his property. When things are quiet, people find odd jobs around camp, share skills (either activist skills or just fun stuff, like gymnastics), or help plan the next action. But things aren’t quiet all that often! 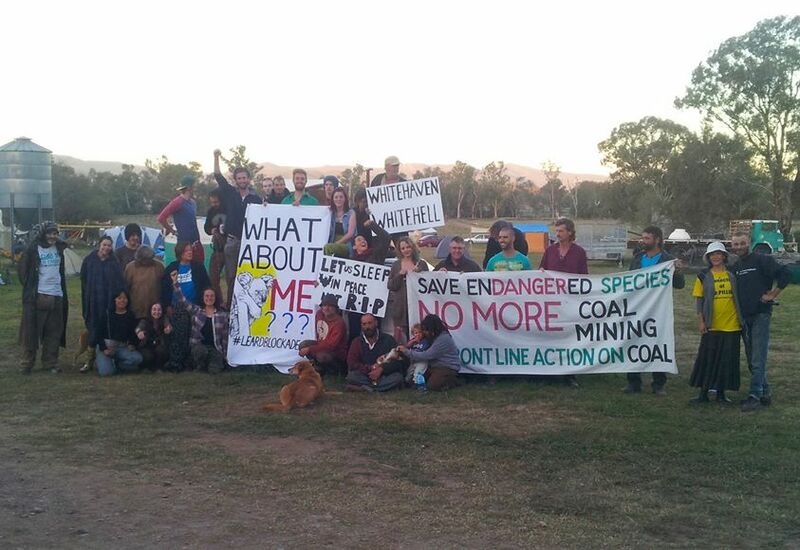 With such widespread, diverse support for the campaign, there’s always someone coming out to put their body on the line to stop this coal mine. Recently a choir came to protest, before that a group of doctors, before that, a coalition of multi-faith religious leaders. Many people come out on their own, too – parents, scientists, lawyers, engineers. The constant influx of people guarantees that there’s always work to do – after all, every person who decides to put themselves in an arrestable position depends on the support of several people in non-arrestable positions. If ever I had any doubts about whether or not Non-Violent Direct Action (NVDA) could be effective against the mining industry, the police have laid them to rest. They’ve blocked the Leard Forest Road to keep us out, sent hourly patrols past camp, brought in riot police and flown over with a helicopter. Our opponents have even sent spies into camp. In spite of all this, people have still managed to carry out civil disobedience and thwart construction. It all goes to show that no amount of overbearing police presence, espionage or intimidation can stand in the way of ordinary citizens with courage and determination on their side. 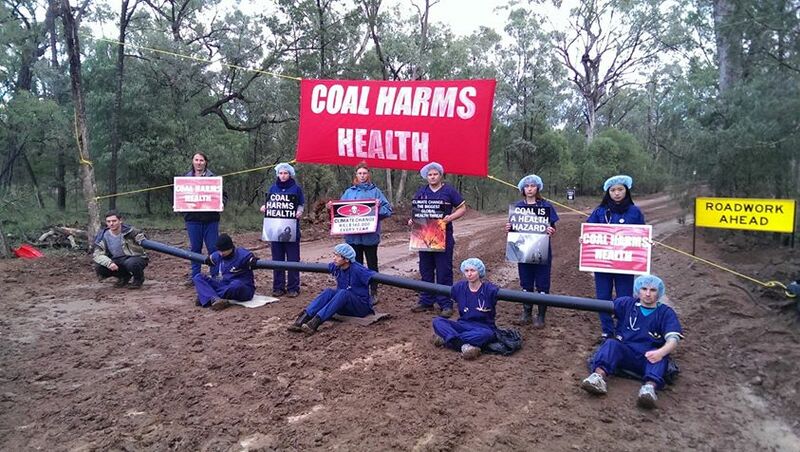 If you’re interested in learning more, or coming out to visit camp, you can watch the #Leardblockade hashtag, get in touch with us at frontlineactiononcoal@gmail.com, http://frontlineaction.org, or on the Front Line Action on Coal Facebook page. This entry was posted in Aboriginal and Torres Strait Islander, Activism, Climate change, Culture, Economics, Environment, World Health and tagged activism, capitalism, climate change, coal, divestment, economics, environment, Leard State Forest, LeardBlockade, Maules Creek, non-violent direct action, politics, sustainability by Liam Ellis. Bookmark the permalink. Liam Ellis has been involved with climate activism for three years. He has previously worked on the ongoing Repower Port Augusta campaign, and has since moved on to join the Leard Blockade. After this current effort, he hopes to move on to broader anti-racist causes. Inspiring Liam!! Thank you and all of the people working on all aspects of this campaign. Funny how the Gomeroi didn’t give a toss about the Leard until the mine started their project. And while you’re there mate note the thousands and thousands of hectares of unendangered bush land in the surrounds. A hand full of gruby activists and self-interested farmers doesn’t give you lot a “social licence” to do as you please either ! Hi Liam, congratulations on a great article! Hoping to see you again soon at Maules Creek or elsewhere.